Relationship goals are probably the most stressful ones. Relationships are supposed to be between two people where love feels like home. Love between two people is supposed to be stress-free. However, you then stumble into a relationship where it feels like your dating the editor of a magazine; a critic. because now you’re changing for love? love isn’t supposed to change who you are at all. I was told that I need to learn to be calm and cool, because cooler heads prevail and take courses. You can’t change a person by their character. You can change habits, not people. I will always be emotional, I will always I’m impatient, I will always be hot headed. Changing isn’t an outlet for character. I will always love myself, flaws and all. Until then I realized truly, the cold hard truth about love. Someone may be perfect for you, but you may not be perfect for them. In this case, I wasn’t perfect for him. But later, after judgement day, neither was he. For the last couple of weeks the word “appreciation” and the act of “appreciating” is far different from what I’ve learned. You can say how much you appreciate someone of what they’ve done or what they may do, but act like they mean nothing. You may be there for someone your whole life, family or friends, and with one single action, sometimes the whole bond breaks. Just by one single act. Sometimes you’re there for someone for a week, family or friends, even strangers, and with one single action, they will never leave your side. And then there are those that are always there for everyone, even during deceitful times, but because of a good heart they will always appreciate and love those no matter what. Why do strong relationship keep tabs on who’s done what, how much, for what? I believe that in any relationship, for any situation, for anyone, anywhere, if you truly love or appreciate someone, no tabs should be involved. No differences should take place. And no arguments on the plate. Do something out of love. Do something out of kindness. Good things with selfishness should never take place. If someone doesn’t appreciate you for all you’ve done for them, drop them. The cold hard truth: Never linger those that don’t want to help you during tough times. It’s 2015, it’s time to do things out of kindness and love. Not tallying and hate. Today for our Victoria Day long weekend, I took my two and a half year old baby cousin to Downtown Toronto with me. 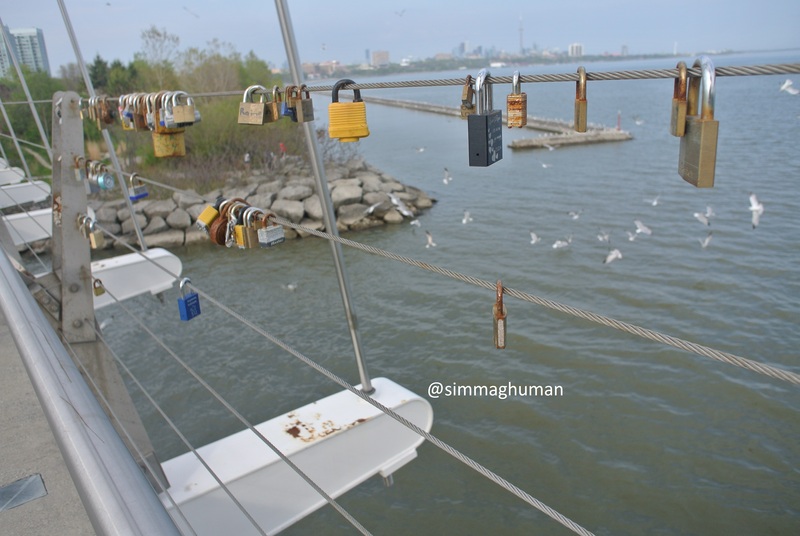 We walked on the Humber Bay Arch Bridge, and came across the Love Locks everyone does in Paris, France. However, us Torontonian’s have created our own version here. Love locks: A love lock or love padlock is a padlock which sweethearts lock to a bridge, fence, gate, or similar public fixture to symbolize their love.Typically the sweethearts’ names or initials are inscribed on the padlock, and its key is thrown away to symbolize unbreakable love. Spread some love, not for this week, not for this month, but forever. Spreading love even at an arms length can go a mile away. Everyone needs a little bit of loving, everyone needs to know the feel of being loved. So go on, lock some love and attach it to a bridge! Today is going to be a little bit different. A group of my close friends and I have recruited together to be apart of an amazing cause with an amazing organization: Canadian Mental Health Association. Being an active member, we have created a group to join in with the CMHA Ride don’t Hide 100km bike event! On June 21, 2015, thousands of cyclists will come together to celebrate and strengthen mental health for all Canadians while raising $1,000,000 for mental health programs and services. We have just registered the group, so please, during the process of getting it all together, donate for a great cause! Please visit the page below and donate and if you’d like, join our team as well! Let’s fight mental health one pedal at a time, and cheer for Woes on Wheels! Thank you Xox! … is when you wake up seeing the brighter. … is when you feel a little bit lighter. … is when you speak a little bit softer. … because that is what will get you there. … because it is the only ingredient to revive you. Without hope how can you possibly breathe? Why clog precious miracles with dull moments? Why live in dead dreams? It will end, for the better. But with that, you hope. Because hope is when you wake up seeing the brighter. She didn’t want to hold on to the poison anymore. She can’t let herself get emotionally drained anymore. She wouldn’t allow anyone come close to her anymore. She needed to let go. Let go all the negativity. to help her move on. To help her get back up. 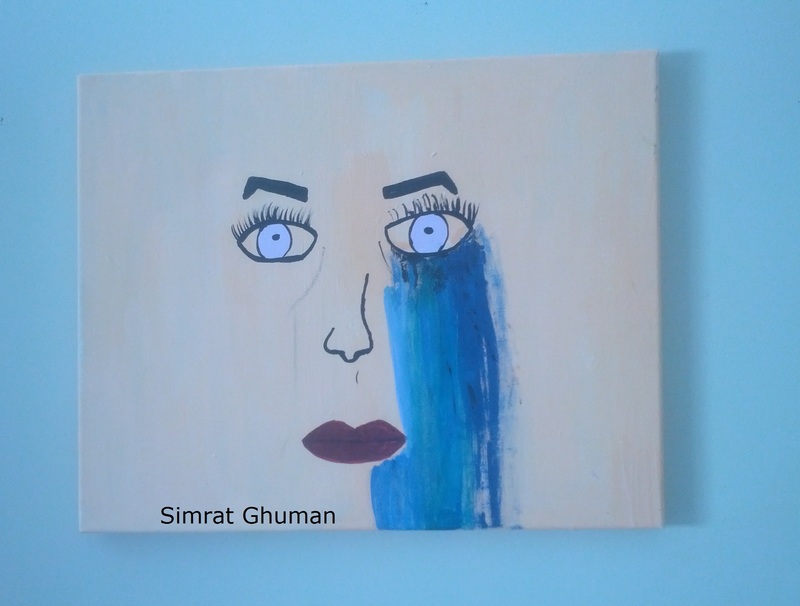 she was reminded of the dark pain. How people around her have hurt her. How people around her had brought her down. How showing her face with a smile across it was the best fake thing to do. Because frowning was never considered beautiful. Because revealing pain was looked down upon. Because being around someone who’s showing their dying inside never looked good. She wants to smile again. She wants to be happy. She wants to get rid of the baggage. she grabbed all the things that reminded her of pain. All the things that are hurting her. All the things that are holding her back. She threw them all into her car. Drove to an open field. Watched the weight that were on her shoulders vanish in smoke into the air. it’s still apart of who she is. she looked at herself as a warrior. However, she never felt so good. Wearing scars never felt better. Now that the winter season is “almost” over, you can throw away your fluffy winter coats, your winter gears of shovels and car brushes perhaps, even your winter sorrows and winter blues. When season changes, and the climates confused, and your wardrobe is a mess, it’s time for you to call all the shots. Just like anything else in the world, one thing is always constant and that is, change. Change something about yourself that changes your perspectives of things to the better. Have some vacation time from work? Use it! Go somewhere not as a vacation, but as an adventure and travel for the time being! Have some new clothes you just brought but never got the chance to wear? Want to learn something new or expand any sort of knowledge you’re curious of? Tired of looking at your old crummy car but you have some sort of saved funding to get a new one? Want to cut your hair? Cut, colour and style it! Lost a loved one, or a friend? Grow within those emotions and strengthen those that are having a hard time doing so. Change is what makes the world go ’round, even today. If you don’t like something you’re doing today, don’t wait till tomorrow, do it now. Or, you should’ve done it yesterday. Excuses and self punishments are what will keep you depressed. Being closed off to change for the new is what makes you feel like you’re doing the same thing over and over and over again. Like you’re stuck, like there’s no excitement to life and living. Feels like such a drag, doesn’t it? Change; revolve around the constant! out with the cold, in with the heat. “I’m trying so hard to fight this feeling. I’m trying extremely hard to convince myself that I will be okay in the next 5 minutes to forever. I tell myself that one day I will start my day off and it will turn out to be good. I tell myself that one day this dim light will start to flicker brighter. I tell myself that one day I will be madly in love with someone who will be equally if not more in love with me. I tell myself that one day someone will fight for me so I don’t feel so alone. I tell myself that one day someone will take bullets for me so I’m not always wounded. I tell myself that one day someone will stand tall with me so I don’t always feel so small. I tell myself that one day I will finally be out of this darkness. Where I am in happiness. Where I am in love. One day, I will tell myself all this, and believe it. Everyday is all about new beginnings. You wake up every morning but you do all the same things. You eat the same thing, you go to work at the same time, you go to the same gym all the time, you choose a whole weekend every month for a night out yet go to the same bar. It’s the same cycle every month every day every year. Why? Because we are so used to what’s comfortable. It’s not what we like or what we want to love, it’s about comfort. Sometimes, comfort is something you should avoid. Just because we feel at ease doing things that we know are safe or things we know so well, it’s not necessarily a good lifestyle. One of the other reasons why I was going through depression was, I was doing the same thing every day. I needed out. And I got out. I changed one small thing about my daily routine and everything slowly adjusted accordingly into a changed day. Everyday. I started painting at night. That shifted my perspective on timing. You see, instead of going to bed every day at a certain time, I started to paint which then created ‘no time’ . I started realizing the value of time and how much you can actually accomplish if you do a lot more outside your comfort zone. And now I am in the process of creating something more out of my comfort zone. And you should too. Perhaps try a different gym, try a different healthy diet, try doing creative projects at night before going to bed. Changing one course will alternate your boredom and feelings from a depressing life to a little more purposeful one. Also, what’s the purpose of new beginnings if you don’t do anything new about them?